Alan Lomax (1915 – 2002) played a major role in recording Delta blues artists from the 1930’s to 1978. In the 1930’s he worked with his father, John Lomax. They made a trip through the southern United States in which they discovered and recorded Huddy Ledbetter in Angola State Penitentiary in Louisiana. In 1941 and 1942, he made recording trips to Mississippi for the Library of Congress, which resulted in recordings of Muddy Waters, Son House, David “Honeyboy” Edwards and others. He made the first recordings of Muddy Waters (1941-42) at Stovall Farm near Clarksdale. He also made historic recordings of Son House in Tunica County 1941 and 1942. 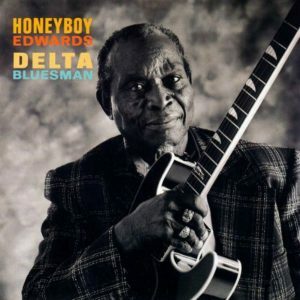 He also recorded David “Honeyboy” Edwards (1942) and other Delta bluesmen. Here are some of the highlights of Alan Lomax’s career which relate to Mississippi and the Delta blues. 1938 – Alan Lomax meets Jelly Roll Morton in Washington, D.C. Jelly Roll Morton had ben one of the leading musicians of the 1920’s but the Depression had had a major effect on Morton’s fortunes. 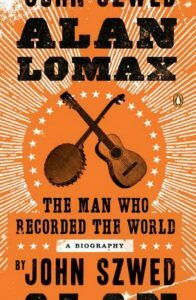 His music career was dormant at the time and he was working as the manager of a small nightclub in Washington, D.C.
Alan Lomax made several recordings of Jelly Roll Morton for the Library of Congress. Alan Lomax also recorded W.C. Handy for the Library of Congress. 1941 – In August 1941 Alan Lomax went into the Missippi Delta with John Work of Fisk University. 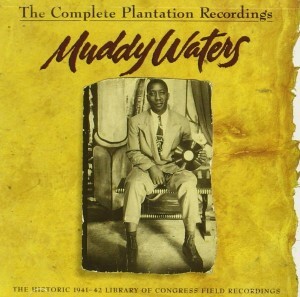 On August 31, they recorded Muddy Waters at his home on Stovall Farm outside Clarksdale in Coahoma County. There is now a Mississippi Blues Trail marker at the site. On September 3, Alan Lomax found Son House on a plantation near Robinsonville in Tunica County. When Lomax asked Son House to record, Son House said he had to get his band together. Lomax drove House on a circuitous trip on which they picked up Willie Brown, Fiddlin’ Joe Martin and Leroy Williams. Alan Lomax recalled, “I don’t know where House took me. Down dirt roads, along a railroad track into the back of an aging country store that smelt of licorice and dill pickles and stuff.” The “aging country store” was Clack’s Grocery, near Highway 61, where Lomax recorded a now legendary session of Son House and his friends playing on the front porch of Clack’s Grocery. Clack’s Grocery was selected as a recording location because it had electricity to run Alan Lomax’s recording equipment. Lomax recorded five songs with Son House at this session: Levee Camp Blues, Government Fleet Blues and Walkin’ Blues with all four musicians performing as a quartet, Delta Blues, with Son House accompanied by Leroy Williams on harp, and Shetland Pony Blues, with Son House performing solo. The session is particularly notable for the sound of a passing train (Clack’s Grocery was also a train depot and the rail tracks ran nearby) about two minutes into Walking Blues. 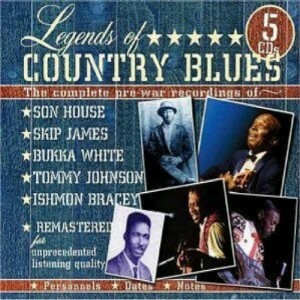 The sound of the passing train on Walkin’ Blues is mentioned in every history of this session. The session also produced several recordings of Willie Brown, Fiddlin’ Joe Martin and Leroy Williams performing in various combinations, the best known songs being Fiddlin’ Joe Martin’s Four O’Clock Blues , Willie Brown’s Make Me A Pallet On The Floor and the acapella Camp Hollers.. There is now a Mississippi Blues Trail marker commemorating Son House near the site of Clack’s Grocery. Clack’s Grocery Store is no longer standing, nor is there any evidence of it having been there. 1942 – On 17 July, Alan Lomax recorded another session with Son House, this time in Robinsonville. Son House performed alone on this session, which produced eleven songs: Special Rider Blues, Special Rider Blues, Pt.II, Low Down Dirty Dog Blues, Depot Blues, American Defense, Am I Right Or Wrong, Walking Blues, County Farm Blues, The Pony Blues, The Jinx Blues, Pt.1 and The Jinx Blues, Pt.2. 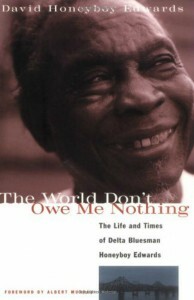 David Honeyboy Edwards autobiography, The World Don’t Owe Me Nothing. Book cover. “Alan Lomax was going around the South recording folks for the Library of Congress. I saw him one time in Clarksdale and then when I was playing in the streets of Friars Point one Saturday evening, drunk, cap turned back on my head and hollering. He walked up after I got done playing and told me who he was, how he was recording different musicians. We talked for a while and he said he’d like to do an interview and a recording with me. I told him where I lived, but I thought he was just some honky talking out the side of his mouth. Then I played in Jonestown for that bootlegger Son Collins on a Saturday night, and the next morning I was laying up in my woman’s bed and woke up out of a dead sleep. I heard a car pull up in the yard. I heard the car door slam and then a white man’s voice, talking low, talking to my gal’s auntie. It was Alan Lomax. Auntie – back then old colored folks was scared of white people – she didn’t know what to do. He stood out there and said, “Is David Edwards, Honey, here?” She said, “I don’t know. He come by the house sometimes.” He said, “Well, my name is Alan Lomax and I’m from Washington, D.C. I’m from the Library of Congress. I just want to record him, that’s all.” He seen that she was scared, backwoods. When she told me this man from Washington wanted to record me, I said, “Tell him, yes, I’ll see him!” and I got up and put some clothes on. I recorded for him that day on 1942, it was the twentieth of July. He had just come from recording Son House and Willie Brown. Alan Lomax drove up in the yard in a brand new Hudson, 1942 super-six, dark green. I got my guitar, put my harp in my pocket, and got in the car with him. He got me a room in a little Delta tollhouse, like a tourist camp. He got a room for himself and one for me and then he bought me dinner. He was really nice to me. Then we went to a great big school, a Rosenwald School. Rosenwald Schools was put up at that time all over the South for blacks, so they could have nice schools to go to. Rosenwald Schools was nice schools with ten or twelve rooms to them, painted brown with white windows. I did seventeen numbers for him! I could think faster than a monkey, and just like that I done seventeen numbers in about and hour and a half………We recorded more back at the tourist camp. And after that he gave me twenty dollars…….He brought me back home and then went further down the Delta. He was recording everybody. He was going down then, on the way down to Rolling Fork to record Muddy Waters……”Other David “Honeyboy” Edwards tracks recorded by Alan Lomax on 20 July 1942 include: Roamin’ And Gamblin’ Blues, You Got To Roll (acappella), You Got To Roll (Levee Camp Song), Stagolee, Hellstakin’ Blues, Wind Howlin’ Blues and Tear It Down Rag.There is a Mississippi Blues Trail marker at Stovall Farm, near Clarksdale, Mississippi, where Alan Lomax recorded Muddy Waters in 1941 and 1942. In 1942 Alan Lomax also recorded Sid Hemphill near Como, Mississippi. 1959 – Como, Mississippi – In September 1959 Alan Lomax made the first recordings of Mississippi Fred McDowell at McDowell’s home near Como, Panola County, Mississippi. 1978 – August 1978 Como, Panola County, Mississippi – Recorded Otha Turner, Napolian Strickland in Como, Mississippi. Sam Chatmon in Hollandale, Washington County, Mississippi. The 1978 trip resulted in a documentary entitled The Land Where The Blues Began. It can viewed online here. The Alan Lomax Archive is administered by the Association For Cultural Equity. Here is a link to the ACE’s home page for Alan Lomax.